We're back with more Anorak Thing picks after our Summer hiatus! 1. 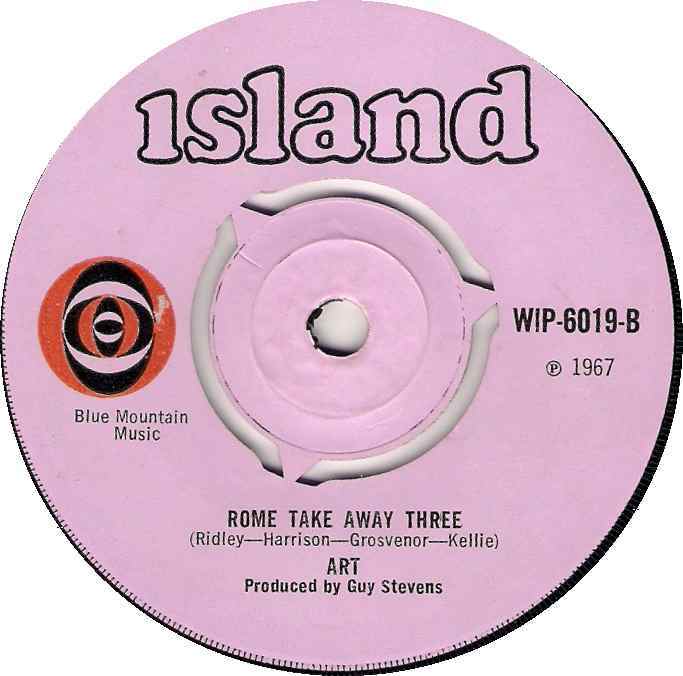 ART-"Rome Take Away Three"
From the ashes of mod/r&b aficionado's The V.I.P's came Art who cut just one 45 and an LP for Island before changing their name and adding New Jerseyite Gary Wright to become Spooky Tooth. This was the flip of their sole 7", a cover of The Buffalo Springfield's "For What It's Worth", it's powerful like The Creation's "Tom Tom" but with soulful vocals and WAY heavier than anything The V.I.P. 's would have done. 2. THE DRAMATICS-"It's All Because Of You"
Anyone who's read "Detroit 67" or saw this past summer's film "Detroit" will be familiar with the tragedy that befell the Dramatics after the release of this powerful track (which figures prominently in the previously mentioned flick). 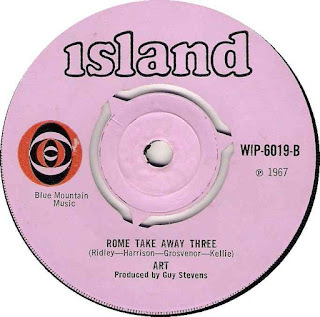 Their last before eventual stardom on Stax it remains their most powerful and most sought after 7 inch. From the soundtrack to the trippy 1973 classic film "Psychomania" comes this wah-wah driven classic by the great John Cameron, totally witchy and spooky with ethereal female backing vocals blending in with the strings. Pure magic! Sound Dimension were basically the Funk Brothers of Coxsone Dodd's Studio One label and played on more ska/reggae than we'd have room to list. This 1969 interpretation of the Young Holt Unlimited instrumental is one of my favorites by them. Some songs are meant to be blasted loud in joyous celebration whether you're a teenager in the back of a pick up truck on your way to the beach in 1982 with this on a boom box on the last day of school or on an iPod by 50 year old dad who's savoring Japanese beer after getting the kids to sleep. Cheers to the excellent "Piccadilly Sunshine" CD compilation series for constantly unearthing U.K. 60's pop/psych 45's like this interesting reading of "Hey Joe" from 1969 by one Bob Saker. You would think a pop psych treatment of "Hey Joe" wouldn't work with the requisite strings, brass, woodwinds et al but it does and the lyrics are altered slightly to turn it into an anti-war protest which is a nice touch! 7. PAUL REVERE & THE RAIDERS-"Indian Reservation (The Lament Of The Cherokee Reservation Indian)"
I remember lots of songs from my childhood but the first one that I really liked was this 1971 #1 (their only #1!) by Paul Revere and Co. (their last top ten hit as well). I was 5 or 6 and I was fascinated with Native Americans at the time and my dad explained the lyrics to me and I had my first experience of anger at injustice and social consciousness. The trippy fading strings and the Hammond at the fade still make the hairs on my neck stand on end 46 years later. 8. BO DIDDLEY-"I Can Tell"
It's hard to pick a fave Bo Diddley tune, but for me the $ has always been on this cooking little tune from 1962 found on the flip of the equally powerful "You Can't Judge A Book By The Cover". I think my favorite part of the tune is the powerful bass line that set the template for so many great British r'n'b tracks. 9. DEL SHANNON-"Mind Over Matter"
There are many sad stories involving Andrew Loog Oldham's Immediate records label but none sadder than him flying Del Shannon out to the U.K. in '67 and presenting him with the cream of the crop to back and him and a bevvy of amazing songs to record for an album that never was. 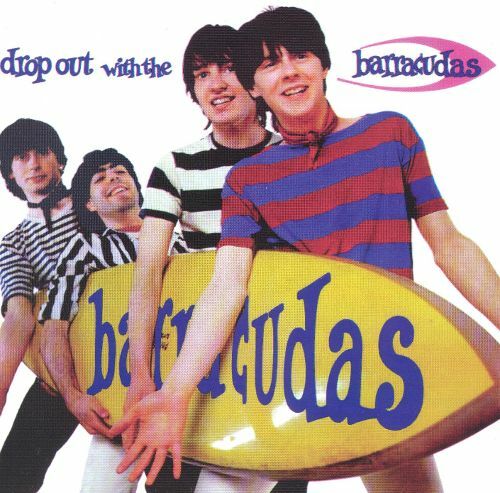 This number is my fave of the bunch and was actually released as a 45 in the UK in '67. 10. 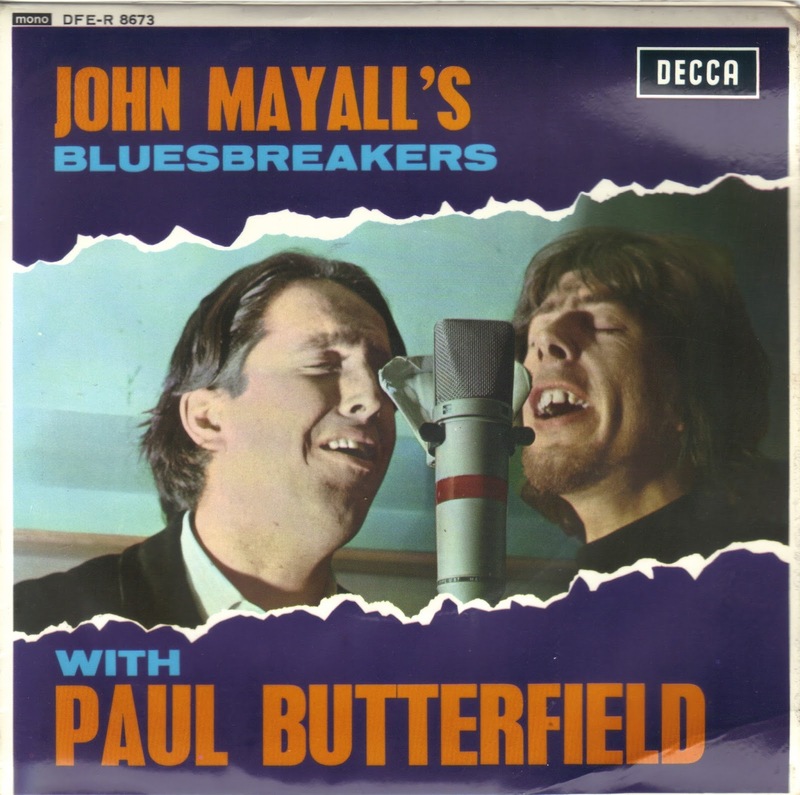 JOHN MAYALL'S BLUESBREAKERS with PAUL BUTTERFIELD-"Ridin' On The L And N"
From the 1967 U.K. Decca E.P. 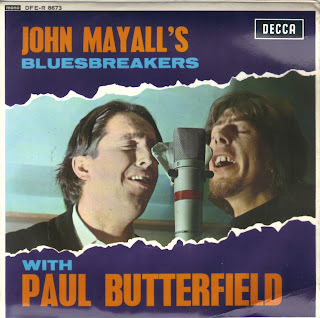 that saw Mayall and Co. collaborate with American Paul Butterfield "Ridin' On The L And N" is my fave track on the disc. It's hard driving, bluesy and superb, what you'd expect from Mayall. The Nashville Teens had one sole hit in the US, August 1964's "Tobacco Road" which reached # 14. 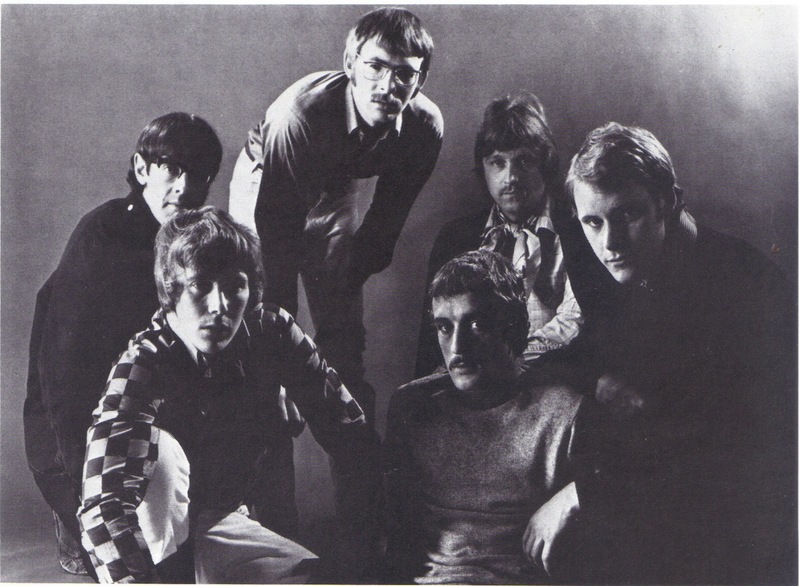 By 1967 their ship had sailed both in the U.K. and the U.S. Their 8th U.K. 45 (Decca F 12542) "That's My Woman"/"Words" was issued in Britain in January 1967. 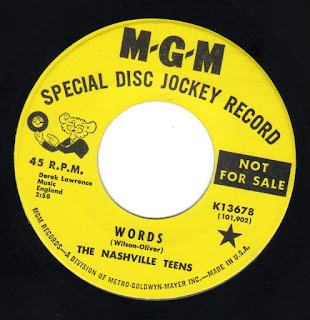 Issued in the U.S. one month later MGM decided to flip the 45 putting the stronger "Words" on the A-side. It made little difference as it failed to chart. "Words" is the stronger of the two in my book. Led by some slick horns and muted fuzz guitars and almost disembodied backing vocals that shriek out "Words!" it's probably one of the freakiest things they ever cut and certainly their most soulful. The horns and fuzz guitars make it a strong contender for the "freakbeat" moniker. Both tracks can be found on two out of print Nashville Teens CD comps "Tobacco Road " and "The Best Of 1964-1969".